For the last week, the internet has lost its mind over District 9 and Elysium director Neill Blomkamp stating he doesn't want to helm the next Star Trek movie. I, for one, am glad. Not because I don't like Blomkamp's work, but because no one should direct the next Star Trek movie. There shouldn't be a next Star Trek movie, period. Star Trek belongs on television. 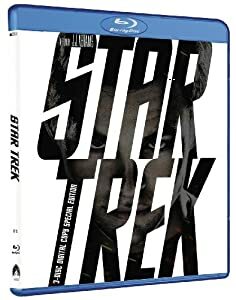 Including the new JJ Abrams Star Trek. TV Guide just anointed Star Trek as the greatest sci-fi show of all time. George Lucas has gone on record saying that without Star Trek, Star Wars never happens. At the end of the nostalgia-obsessed Star Trek Into Darkness -- about which I have very strong feelings -- The Chris Pine/Zach Quinto versions of Kirk and Spock are about to embark on the infamous Five-Year Mission to seek out new life and new civilizations, boldly going where no one has gone before. That mission should happen -- with the cinematic Abrams cast -- on television. The why is obvious -- blockbusters are typically callow, shallow spectacles of anti-intellectual cotton candy. Star Trek is the opposite of that. As to how we get Trek back home to the small screen, read on. Sign Chris Pine, Zach Quinto, Karl Urban, Simon Pegg, Anton Yelchin, John Cho, Alice Eve and Zoe Saldana to five-year contracts to produce a total of 65 episodes of Star Trek television. That's precisely how many episodes are required for a classic rerun syndication agreement. It's also five 13-episode seasons of one-hour shows, which is precisely what is required for a mid-season replacement on broadcast TV or a Game of Thrones-style mini-season on premium television. It's short enough to allow the stars to continue their other movie and television commitments, but substantive enough to give a real sense of a five-year trek into the unknown. And that's the real point. Commit to five seasons and 65 episodes; no more, no less. Make this an event. That deviation alone will change the game, as the studios behind Star Trek will be on the hook for a serious investment, so they may as well make it good. But, being finite, the fans -- even the casual, non-Trekkie admirers Abrams brought into the fold -- will have to give it a look. It's rare for anyone to write a check like that in Hollywood, but Star Trek -- with a movie-star cast and refreshed iconic status quo -- is the rare franchise worthy of the risk. That same scarcity and iconicism should play out, and pay off, behind the camera, too. Hire a nominal showrunner and basic writing staff to sketch out the five year plan -- much as Paramount ran the Next Generation writing staff -- but from there, Star Trek should serve as like sci-fi equivalent of Shakespeare (or, perhaps, Saturday Night Live), with Hollywood's best and brightest from movies and television lining up to play with these peerless and timeless characters and settings. Imagine, if you would, a two-episode arc written and directed by Joss Whedon. A one shot from Community's Dan Harmon, with Donald Glover as a guest star. Let the franchise bury the hatchet with Harlan Ellison or J. Michael Straczynski and give them the lead writer's chair for a show or three. Let Michael Chabon have a crack, or Stephen Moffat. Bring Ron Moore home for a stay. Even step outside the genre. Would Aaron Sorkin like a chance to do Trek for a day? Would David Mamet, or Stephen King? Or even Larry David? Star Trek had its comedic episodes, too, and I can scarcely contain the my joy at the prospect of watching Big Bang Theory creator Bill Prady getting a shot at the Kirk-Spock snark & deadpan combo. And this is before we even discuss guest stars. Star Trek has a rich history of Hollywood elite showing up on the deck of the Enterprise. If we build this newly venerated TV run, would not Ian McCellan stop by for a show or two? Or Judy Dench? Or John Malkovich? Or Morgan Freeman? Or Meryl Streep, perhaps? It would take but a week of their time, and as such opens the doors to almost anyone still working today. The same could be true of directors. Ridley Scott would never sign on for a Star Trek movie, but he could spare a week or two to do an episode. Could we perhaps finally get a Spielberg take on Star Trek, or even George Lucas? It would be a blatant stunt, but one too compelling to ignore. Heck, I bet Blomkamp would actually sign up for an episode, given it has so many fewer pressures and so many more options than a blockbuster movie. And that's the point. Again, there are only 65 slots here. Once it's over, it's done. The opportunities are limited, and that makes them great. Five years. Sixty-five episodes. One mission. One chance at history. Stripped of the multimillion-dollar budgets, Star Trek would revert to the writing and acting and allegorical statements that made it great. It could be great again. Or, you know, we could make a lens-flare-and-CGI retread of Search for Spock. Your choice, Hollywood. On Star Trek and male tears. wow - no mention of bringing in SF lits best and brightest to script episodes like the original series did? In theory, I think this an excellent idea. But I'd prefer to see it re-booted from scratch to get rid of the current Kirk & Spock as superheroes dynamic.